Intuit is well known as the maker of the popular QuickBooks software for accounting, but they also provide a full range of merchant services through their website. Intuit merchant services promises to get your invoices paid faster, and without any contracts required you can try them out risk free for 30 days with no obligations. As a global accounting software company, Intuit provides customer support for their merchant accounts on a 24/7 basis so you can always get help and support when needed. 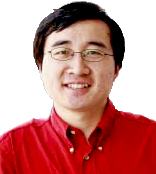 They also offer a variety of methods for using their service. - Mobile Device. With the Intuit GoPayment service you receive a card swiping device that attaches to your iPhone, Android, or iPad and allows you to process payments quickly and easily. - Online. 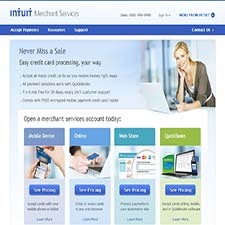 You can use the Intuit service online with the free card reader, as typed input or through a number of ecommerce stores. - QuickBooks. Of course the merchant accounts synchs with the Quickbooks application, allowing you to seamlessly import transactions directly to Quickbooks for ease of accounting and auditing. It should be noted that there are charges for transactions which range from 1.75% to 3.96%. There are also monthly fees paid directly to Intuit. The service works with Visa, Mastercard, Discover, and American Express cards. Credit card companies require merchants to be PCI complient and Intuit charges a PCI compliance fee, which includes $50,000 in Breach Protection Coverage in the event of a security breach. The PCI compliance fee is dependent on the number of monthly transactions and is charged annually beginning in the fourth month of service. The idea is good. They try to make it simple and integrate it with QuickBooks, which should save time. They advertise competitive rates. But, the main problem is that Intuit used First Data to provide the merchant services. First Data has to be one of the worst service providers. I have spent hours on the phone trying to make the pin pad work, which has never happened. I mainly wanted to be able to accept Interac, for which you need a pin pad, but was never able to use the chip reader. It is really embarrassing to have a customer wait 15 minutes for us to get the system to work when all they want to do is pay and leave. They advertise competitive rates for standard transactions, but all transactions end up being ‘premium’, and end up costing more than other competitors. When I inquired about this, the have a lame line in regards to whether I would have taken payment or not. The point is that I would have used a different service provider. The monthly statement is 12 pages long for 3 transactions and is set up to daze and confuse. They charge your monthly basic fee during the month in advance. They charge transaction fees at the time of the transaction. And then they charge the card brand fee during the month following the transaction. This tactic is designed so that you can not figure out your actual transaction costs unless referring to 3 months worth of statements, and adding the costs together. I have paid $550 for a pin pad that has never worked. It made more sense to purchase it rather than rent, as my intention was to use the service for a long time. When I inquired about returning it, since it has never worked, and they must have records of my hours spent on the phone with the united nations of technical support. The response to date has been that they will get back to me, and guess what, no response. Finally, when I had enough of a service that was not working, I phoned to cancel. Got the old run around and lied to. First Data takes days to reply to my call, because the person who answers the phone can not take cancellation requests. Someone phones back a week later, and tells me that I have a 3 year contract, which is a lie. I ask them to send me a copy of the contract, and they never do. Intuit advertises that you can cancel at any time. Now waste more time, and have to phone again to cancel. I am told that it takes weeks to cancel, even though my initial request to do so was a month prior. They have access to my bank account and continue to debit the monthly fee. The only way that I could get them to go away was to pay for a stop payment with my bank. The bottom line is that the advertised processing rate of 1.7% has ended up costing me more like 8% when you consider in the cost of the pin pad, the wasted time with customer support and the run around. The time wasted trying to reconcile a bank account that has had fees deducted numerous times rather than just once a month. My recommendation, is not to walk away from this service, but to run as fast as you can. The use of gopayment as a stand alone has been good , with the swiped rate @ 2.75% Keyed @3.75% plus card benefits (The things we don’t understand but pay for ie miles cards, corp cards) It has been valuable in the field. You can opt to pay a 12.95 Mo fee to lower the rates to 1.75%/2.75% plus card benefits which is where I am now at. this method will yield an effective rate of about 3% total cost, but be aware for this to pay for itself you need to process =/> 1295.00 monthly. I found this to be about a break even in the fee vs no fee structure. The support is hard to reach by voice but once you do get in touch with the correct dept they are helpful. I process on the computer, and on an android phone both options work well.